As the saying goes, all good things must come to an end. 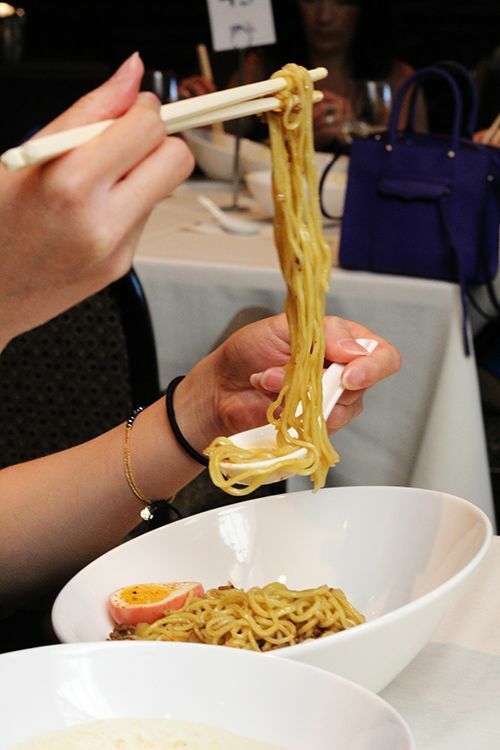 Edmonton first learned of Prairie Noodle Shop in October of 2014, and the demand for a good bowl of ramen has increased ever since. 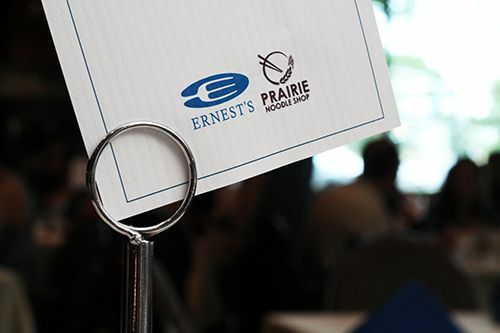 This past Saturday Prairie Noodle Shop hosted their fourth and final pop up, this time at Ernest's, the fine dining restaurant at the NAIT campus. Having a bigger space to host the pop up event meant the team had the ability to serve 150 bowls of ramen - the largest number of bowls to date. Tickets to the event sold out in under five minutes, so if that doesn't tell you Edmonton is ready for ramen, I don't know what does. 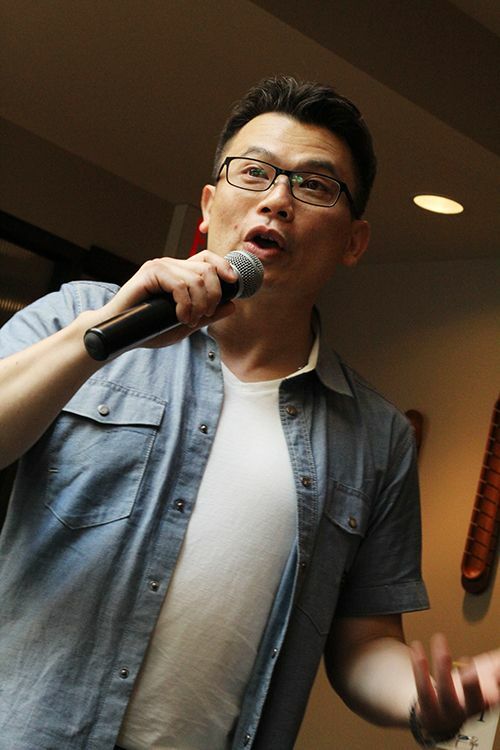 As guests were seated at their tables for dinner, Arden Tse, one of the co-founders of Prairie Noodle Shop, let out some exciting news: a brick and mortar space has been secured and could be open as soon as December 2015. Say goodbye to the anxiety-fuelled, often frustrating attempts to secure tickets for ramen, and say hello to long lineups for a guaranteed bowl. Once all the paperwork is approved and construction starts, the first dedicated ramen shop is coming to Edmonton! As with the previous three ramen bowls, Prairie Noodle Shop brought forth yet another Albertan-inspired bowl of ramen. 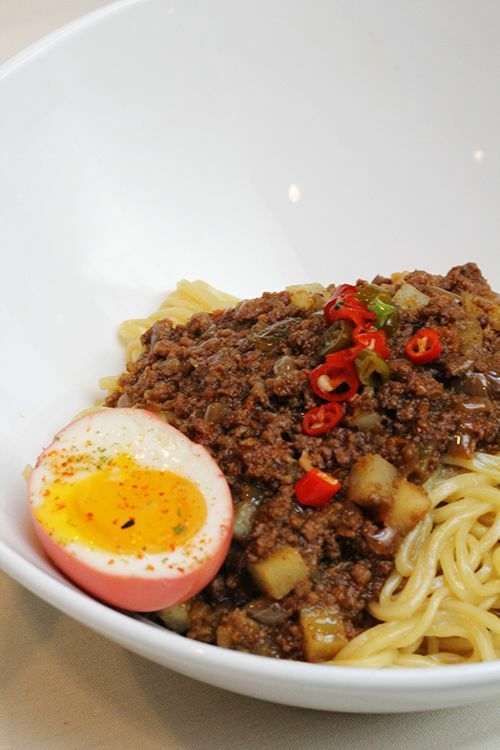 Alberta's "meat and potatoes" loving diet was the inspiration for a tsukemen style ramen, where thick ramen noodles are dipped into a flavourful, concentrated broth. It's not the usual image that comes to mind when you want to eat ramen, but I love that Prairie Noodle Shop is introducing Edmonton to different aspect of ramen culture! So what exactly was in the bowl? This bowl of tsukemen ramen had three different components. Starting with a solid base of good quality ramen noodles sourced from the "Ancient Chinese Lady," the noodles were sticky and springy in texture, ready to be dipped in broth. Beef from D'Arcy's Meats was ground and cooked up tan tan style (or Chinese dan dan style) into a ragu of sorts with black bean paste, carrots, pickled chilies for heat, and cubed potatoes for crunch. The team decided to go with the ground beef as it would allow for meat in every bite and you wouldn't finish one component before another. Lastly came the soup, which was a tangy potato soup, thick enough to cling to the noodles. And of course we can't forget the famous umeboshi egg! 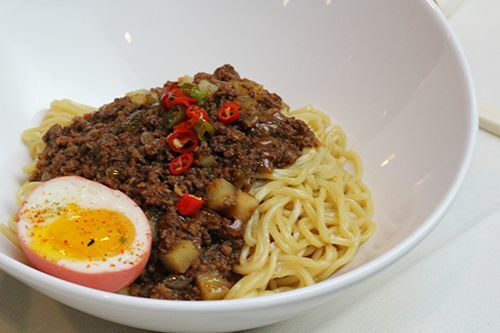 Flavourful, tangy, pink and with an oozing yolk, that egg is a killer component in any bowl. I can't wait for the day that I can have more than one in my ramen! All the components in this bowl really clicked, making it not only delicious, but hearty too. The heat from the ragu really built up with each bite, while the tang of the starchy potato soup toned it down. It's another great bowl of ramen, so if you didn't get a chance to try it, it will be on the menu alongside the pork, chicken, and garlic cheese ramen featured at previous pop ups. Being one of the lucky individuals to have tried all four bowls, I'd have to say I'm on team pork/ I can't wait until I can have that bowl of ramen with the crunchy chicharron. It's been amazing seeing the team at Prairie Noodle Shop follow their passion and develop what is to be Edmonton's first dedicated ramen shop. I can't wait to sit up at the bar and just eat a bowl of umeboshi eggs - yes, that is definitely happening. Congratulations PNooSh and all the best in the rest of your journey, I'll be sure to be there on opening day! Although Edmonton is a winter city for most of the year, summer is my favorite season because of all the fun events and festivals that happen through June-August. Edmonton has often been regarded as a "festival city" given all the events that really draw a crowd. This year Edmonton has the pleasure of being the official host city of the 2015 FIFA Women's World Cup in Canada, which is just one of the many fantastic events that will be happening this summer. If watching soccer games doesn't quite capture your interest, there's plenty of other ways to enjoy the World Cup. There's soccer movies being shown at the Edmonton Night Market, and the Kick it Up! event going down in Little Italy, just to name a few. 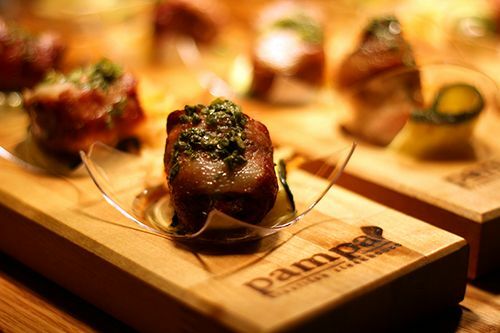 Food never fails to capture my interest, so I was surprised to learn that 13 local hotels/restaurants are featuring soccer inspired dishes on their menus during the World Cup. Whether it be a filling meal or a cocktail, the offerings are pretty fun! I stopped by two of the participating restaurants last week, The Dish Bistro and the Harvest Room at the Fairmont Hotel MacDonald, to see what they were offering. 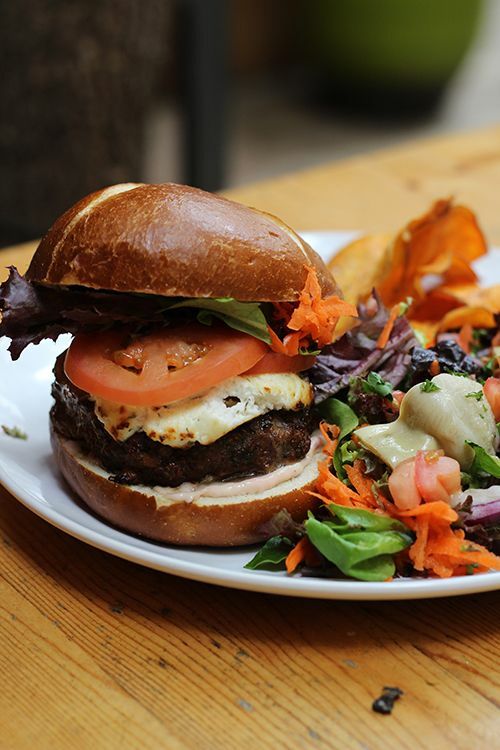 Right along the vibrant 124 Street, The Dish has a Soccer Saskatoon Lamb Burger on their menu for the month of June. 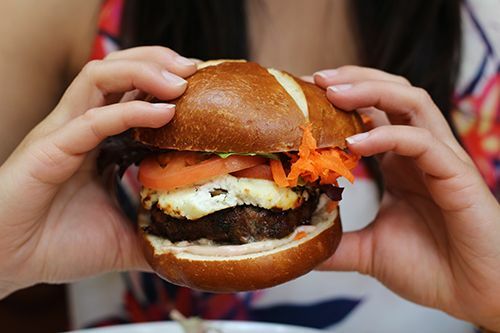 A juicy lamb patty is presented on a soft pretzel bun with caramelized onions, lettuce, tomato, carrots, Saskatoon aioli, and a generous helping of herbed goat cheese. It's the perfect combination of savoury and sweet, and is an outstanding burger you need to eat this summer! Served with your choice of a honey green salad or the soup of the day, enjoy your burger out on The Dish's secret patio (it's a hidden gem!). Without a doubt, The Fairmont Hotel MacDonald has the most beautiful patio in the city. During the World Cup you can enjoy the spectacular view and the Sinclair 12 cocktail, inspired by none other than Canada's own Christine Sinclair. 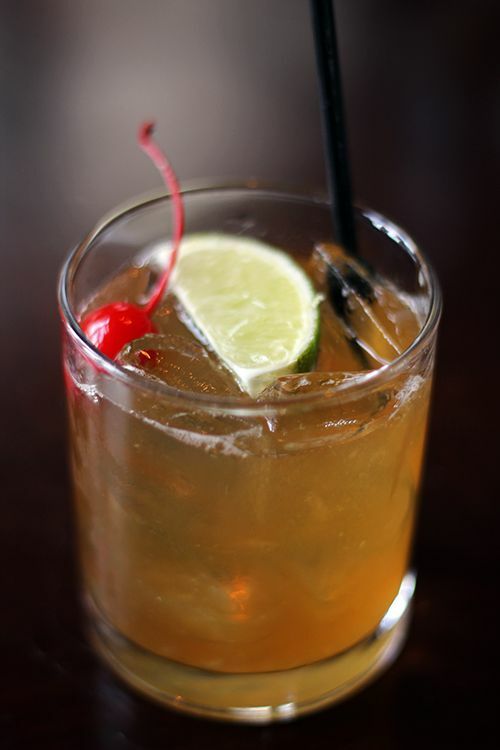 The combination of Canadian Club, maple syrup and lime juice over ice are reminiscent of the flavours found in a classic Old Fashioned, but this drink has some Canadian flair. At the Harvest Room Chef Serge Jost has put Midfield Lamb on the menu. 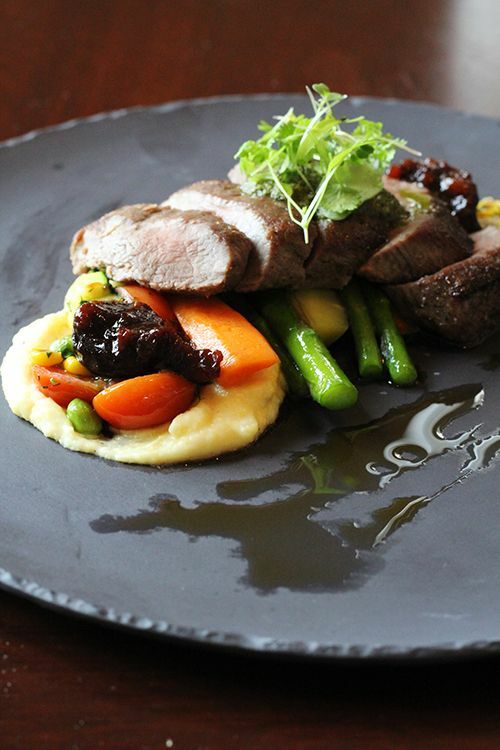 Lamb is cooked to your preference and served on a bed of creamy blue cheese polenta. Fava bean succotash, stone fruit and raisin chutney, baby squash, seasonal vegetables and a mint pesto also sit on the plate in perfect harmony with the lamb. I'm honestly not usually a fan of blue cheese or polenta, but that component was my favourite on the dish aside from the lamb itself. Sherlock Holmes on Rice Howard Way and The Rose & Crown Pub are serving The Canadian Burger. The burger is coated with maple BBQ sauce, crispy maple bacon, and cheddar cheese, and served with ketchup chips and pints of red Canadian beer. Maple, ketchup chips, and red beer. A great Canadian combination! With so many options to choose from, where will you go? I'm thinking I definitely need to take on the oversized poutine dog at The Pint. Anyone want to challenge me? The FIFA Women's World Cup continues until July 4th, so if you aren't taking in a game, grab something to eat in honour of Team Canada! For more information on events around the city, see this guide put together by Edmonton Tourism. Disclosure: I was invited by Edmonton Tourism to try out FIFA inspired dishes and share my thoughts through social media. Views expressed in this post are solely mine, and as always, my priority is to you, the reader, to present an unbiased, thorough review. The sun is shining, the warm August wind blows, and you're seated amongst 350 people on a long table in the middle of Commonwealth Stadium. It's August 12th, and what exactly are you doing here? Enjoying a long table meal prepared by three very talented Edmonton chefs, and raising money for the CapitalCare Foundation at the same time! Being a healthcare professional myself, I'm constantly reminded of the need to support the elderly. A large proportion of our population is aging, and the CapitalCare Foundation is there to fundraise for new facilities and equipment to improve the lives of individuals residing in CapitalCare facilities. As a registered charity, the CapitalCare Foundation bridges the gap where government funding ends. I feel that it is so necessary to fundraise to give back and improve the lives of the individuals that raised and nurtured us - whether it be your grandparents, parents, or close family friends. 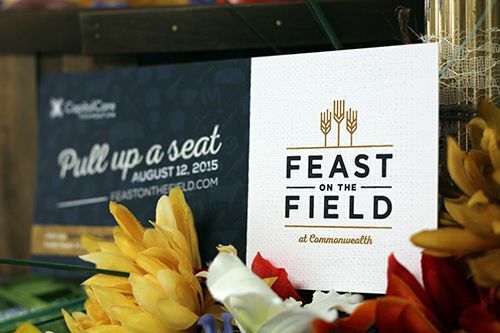 On August 12, 2015, the Capitalcare Foundation will be hosting 'Feast on the Field', a unique long table dining experience on the green at Commonwealth Stadium. 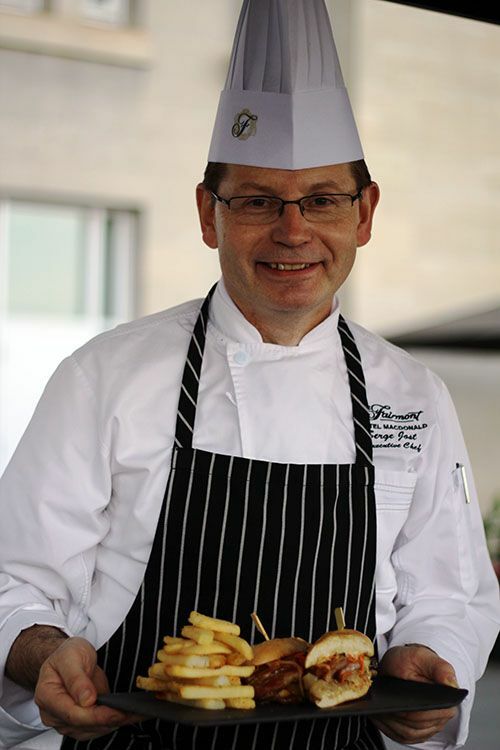 A multi-course family-style barbeque meal will be served by Chef David Omar of Zinc Restaurant, Chef Brad Smoliak of Kitchen by Brad, and Chef Steve Buzak of The Royal Glenora Club. This isn't going to be your typical backyard barbeque, as the menu will be Alberta-inspired and ingredients will be sourced locally where possible. Smoked beef brisket and old fashioned BBQ chicken will make an appearance, but you'll have to secure your ticket to see the full menu. Granville Island Beer and Naramata's Red Rooster Winery will be paired with the dishes that evening, so guests are surely in for one heck of a meal. 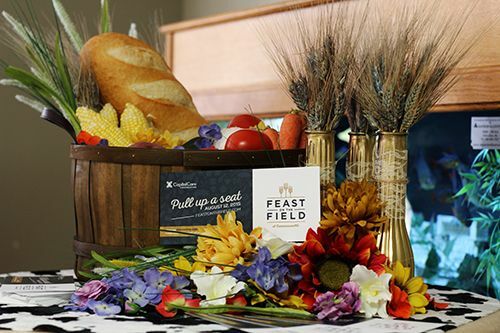 Tickets for Feast on the Field are $140 (+ service fee) per guest and are available through the event website at www.feastonthefield.com. It will be a unique dining experience to remember, spent amongst friends and family in support of this great cause, rain or shine! *Disclosure: I was invited to the Feast on the Field media preview. Views expressed in this post are solely mine. I was not expected to feature this event on my blog, nor obligated to do so. June is one of my favourite months of the year. There's (mostly) no more snow, the temperatures are rising, and Summer officially starts! But another reason to love June is that it is Alberta Pork month. For the month of June Passion for Pork has collaborated with numerous restaurants in both Edmonton and Calgary to feature a pork dish and provide diners with the recipe to take home to replicate. Fun, right? Sharman Hnatiuk is Edmonton's Passion for Pork blogger and she rounded up Linda, Chris and I for a crawl to a few Edmonton restaurants last week to check out their featured pork dishes. If this doesn't inspire you to have a pork crawl of your own, I don't know what will! 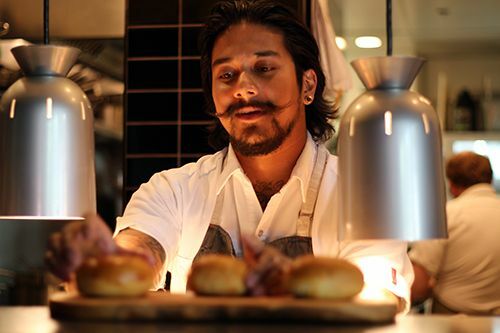 We started the evening at North 53, where Sous Chef Josh Dissanayake is serving up Alberta Pork buns inspired by those his mother made when he was young. Although he loved them, Josh would often take these buns and trade them for other snacks out on the playground. 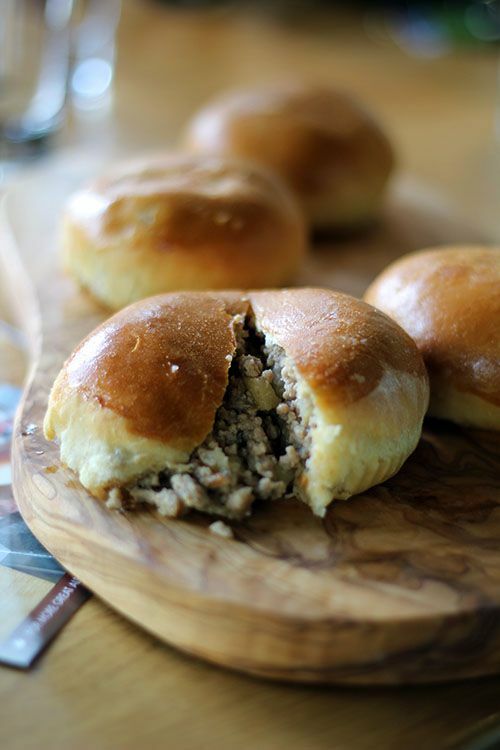 These sweet milk buns are filled with a savoury potato, onion, and ground pork mixture that reminds me of a shepherd's pie. It's a small morsel of comfort food, and at $4 per bun I'd eat a few of them in a sitting! Our next stop on the crawl was at Tzin Wine & Tapas, where Chef Corey McGuire is serving up Pinchitos Morunos (Moorish Pork Skewers - $17). Pork loin skewers are seasoned with spices like saffron, cumin, and coriander to bring North African flavours to the plate. 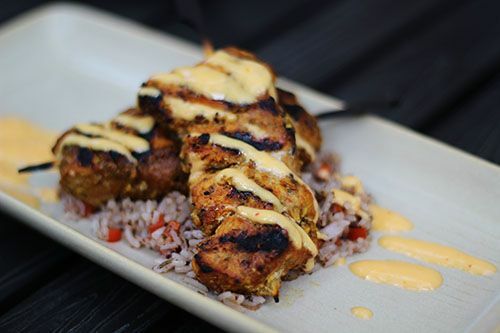 The skewers sit on a bed of dirty rice and are great to enjoy out on the patio. Although it isn't the feature for June, every visit to Tzin warrants an order of their Bacon ($16). 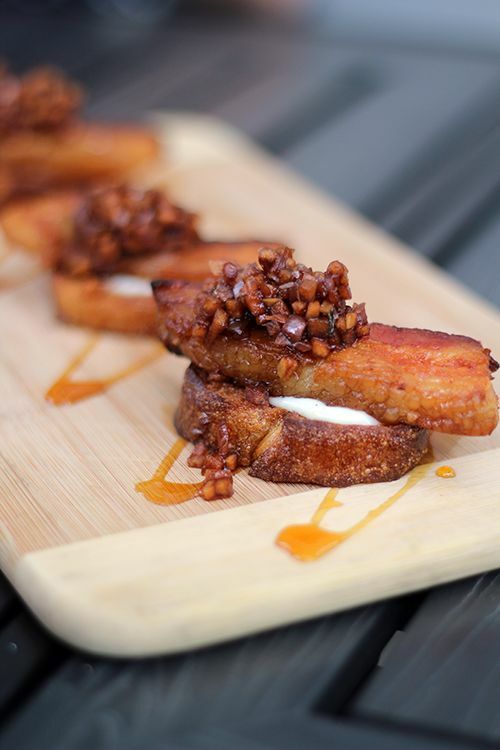 A glorious chunk of bacon sits on a crostini with maple balsamic compote, apple mayonnaise, and a Calvados gastrique. This dish is arguably my favourite pork dish in the city. Tender, crunchy, sweet, savoury - this dish has it all. 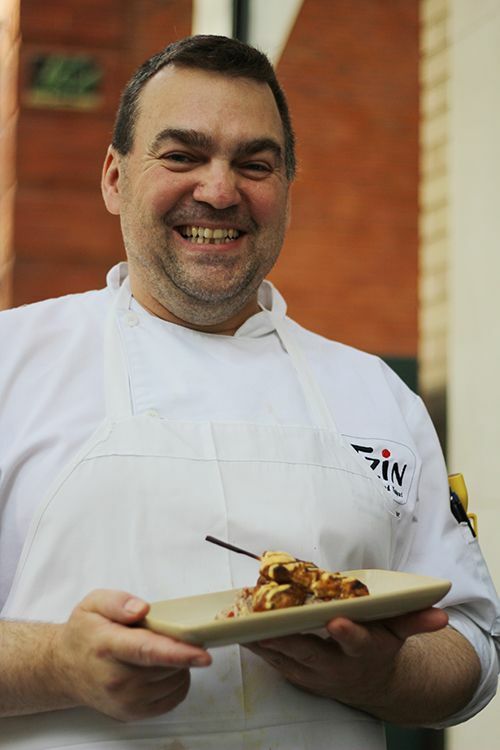 After Tzin we headed straight to the Fairmont Hotel MacDonald to visit Executive Chef Serge Jost. 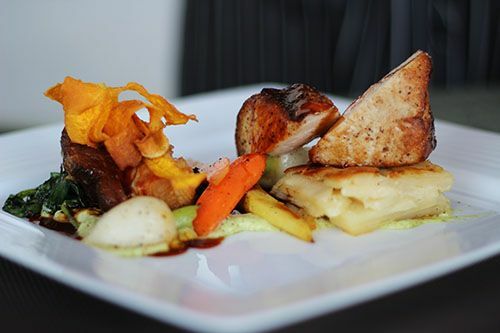 With both the Confederation Lounge and Harvest Room under his watch, Chef Jost actually has quite a few pork dishes on the menu for guests to enjoy in the restaurants, or outside on the best patio in Edmonton. The first dish of the three we tried that evening was the award-winning 1915 Stew. As the Fairmont Hotel MacDonald prepares to celebrate 100 years of history, Chef Jost put together this Alberta pork stew to celebrate the centennial. It's only fitting that it costs $19.15! 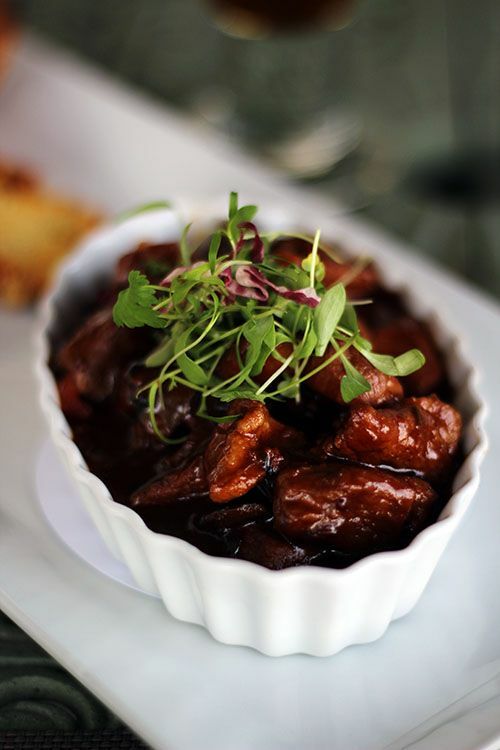 A generous portion of tender pork with hints of chocolate is perfecty paired with the lightly charred cornbread and a beer of your choice. It's unbeatable value for the price. Next up was the Soy and Maple Glazed Pork Belly Sandwich ($17) available at the Confederation Lounge. 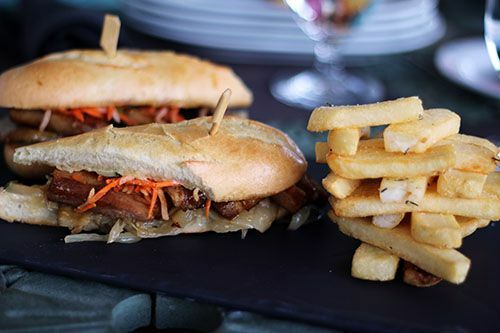 Seemingly inspired by Vietnamese banh mi, the sweet and savoury pork belly sits with pear & sweet onion jelly, pickled cucumber, daikon slaw, and cilantro inside of a baguette. While the side of fries wasn't much to write home about, this sandwich was substantial in size and full of flavour. I did find myself wanting more vegetables to contrast the heaviness of the sandwich, so perhaps skip the fries and replace it with a salad for lunch! From the Harvest Room came the feature Pork Duo ($36) with cardamom crusted nagano pork tenderloin on a yukon gold potato pave and slow cooked caraway citrus pork belly on mustard greens. The entire dish was refined, presented beautifully on a bed of cilantro yogurt, and each component worked well together. And for all you pork belly lovers, Chef Jost is your guy. As he said himself, he "loves to put pork belly in everything!" Our second last stop of the evening was a visit to Share restaurant inside of the Westin. For pork month, Gold Medal Plates winning Chef Ryan O'Flynn created an appetizer, pairing pork belly with arancini and smoked morel mushrooms ($22). The pork belly was well seasoned and the arancini was golden and oozing with cheese, but I did wish for the morels to play a bigger role on the plate. With our bellies at the point of bursting we drove across the river to Packrat Louie, our final destination for the evening. Chef Andrew Cowan recently took the helm at Packrat, and he put together a Pork & Foie Gras Bratwurst. 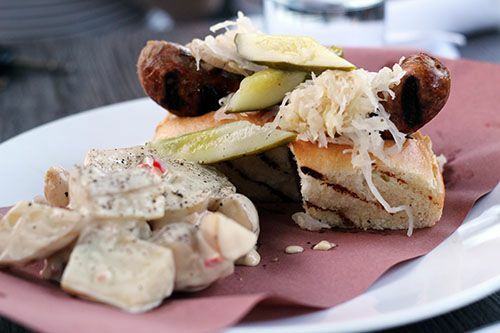 Not only is the foie mixed into the sausage, but the bratwurst is served on a bun with sauerkraut, pickles, and more foie slices on top. Talk about indulgence! The tang from the sauerkraut and pickles were more than welcome to cut the fat of the bratwurst, and the cold potato salad on the side made this dish quite substantial in size. So there you have it, a pork tasting crawl to five restaurants spanning a five hour timeframe. You bet we were ready to pass out in a food coma! Hopefully this crawl inspires you to have one of your own this month, or at least gets you to try out some of the fantastic pork features available in Edmonton until the end of this month. On top of the 5 restaurants we visited, 11 others are participating: Ampersand 27, Canteen, Hart's Table, Hardware Grill, LUX Steakhouse & Bar, Red Ox Inn, RGE RD, Rostizado, Solstice, The Marc, and Zinc. Check them out and collect those recipe cards! 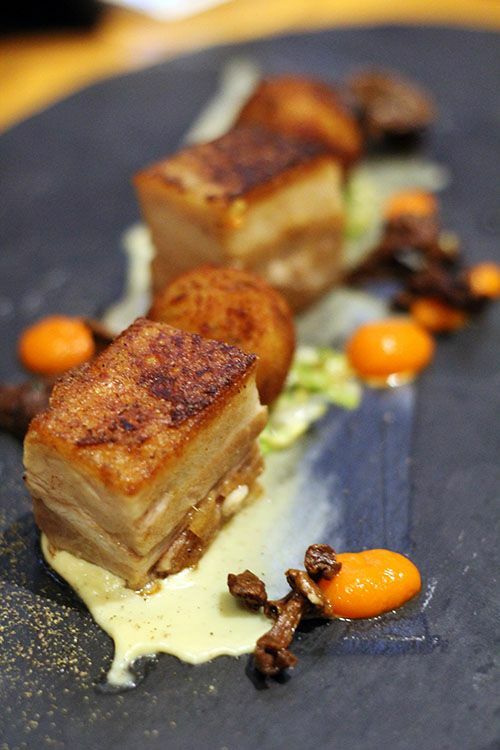 While Alberta is known for beef, it's time for pork to shine too! In conjunction with Pork Month, Porkapalooza is happening this Friday, Saturday, and Sunday June 19/20/21 at Borden Park. The event is free to attend and there's lots of great events going on. Bring the family down for some fun and enjoy the weather! 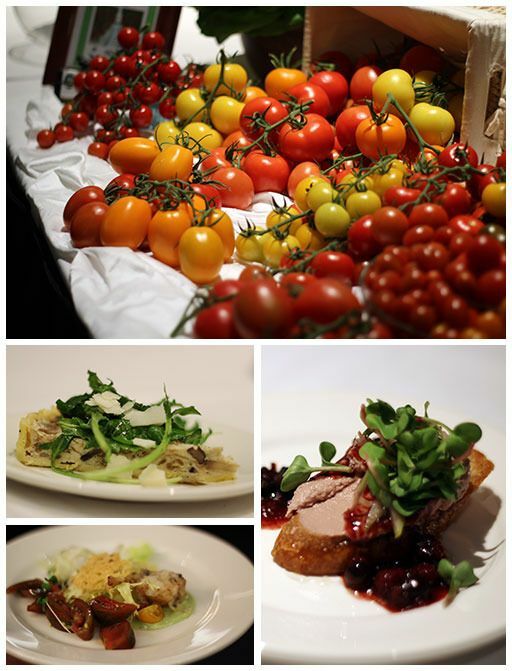 *Disclosure: Alberta Pork/Passion for Pork invited me to attend and sample Pork Month dishes. Views expressed in this post are solely mine. I was not expected to feature this crawl on my blog, nor obligated to do so. This post is 100% my opinion, and as always, my priority is to you, the reader, to present an unbiased, thorough review. If there's one major food event I look forward to each year, it's Indulgence, which celebrates Canadian slow food and wine. 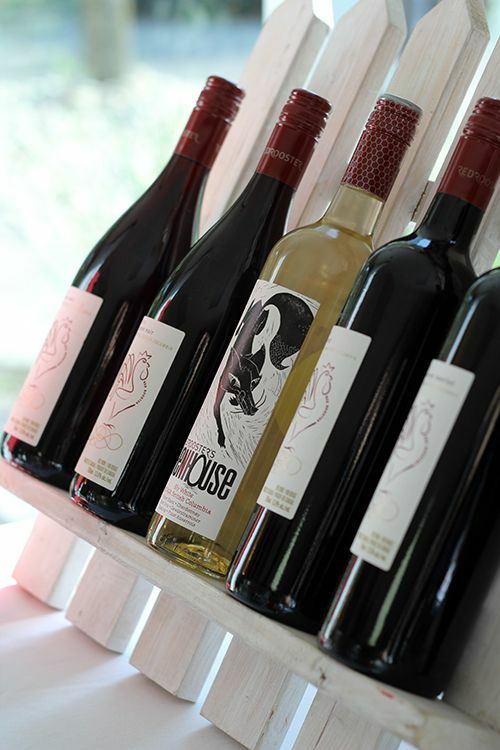 Each year this sold out event brings together Alberta chefs, food producers, and Canadian VQA wines. 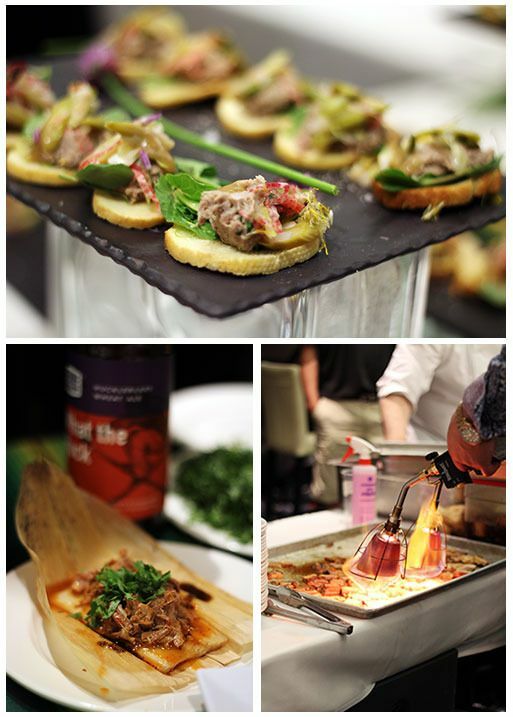 Chefs are given the task to create a dish highlighting the products from a specific producer, and additionally the wineries/breweries suggest a beverage pairing for the dish. Tickets for Indulgence this year went on sale at 9AM sharp on May 1st. The Junior League of Edmonton has been the beneficiary of ticket sales for the past few years, supporting the incredible work they do in the community. Tickets typically sell out within the hour, and I'm not surprised! At $80 per person for unbeatable food & wine pairings, and supporting a local organization, it's hard to say no to buying a ticket. 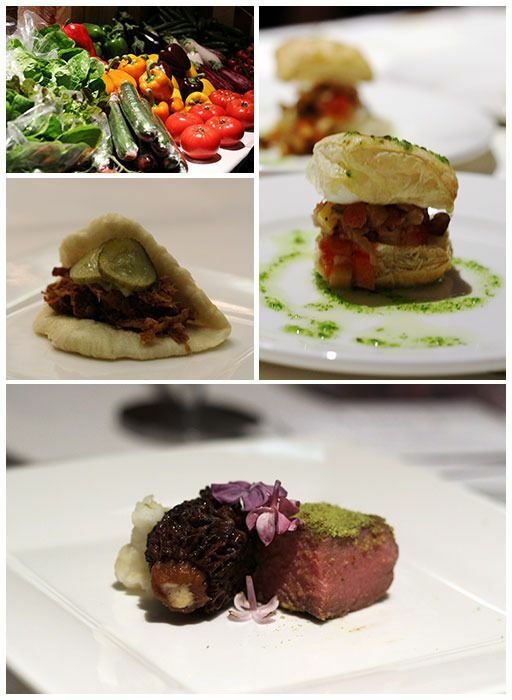 Throughout the evening there were may dishes eaten and wines tasted, but a few dishes stood out above the rest. The prettiest dish for the evening for me was from 4404 Delta who was paired with Rock Ridge Dairy. 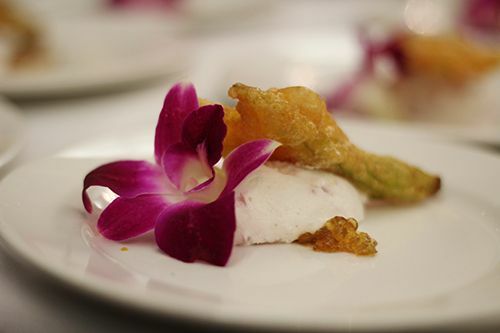 Onion confit infused goat cheese was served on a bed of truffle honey caviars and a tempura fried zucchini blossom, and garnished with a beautiful orchid. 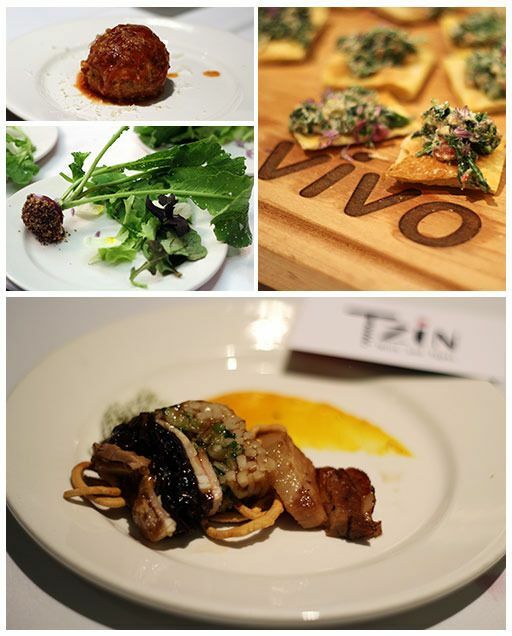 The most unique dish of the evening would have to go to Chef Corey McGuire of Tzin Wine & Tapas. Taking the hot ramen trend and turning it into a terrine was something I didn't imagine I would ever eat. Marinated bamboo, pickled wood ear, scallions, handmade noodles, Tamworth pork broth aspic, smeared marinated egg yolk, pork belly, and a smoked porkfat and nori dust all made it onto the plate. This was definitely a labour intensive dish! So what was the best dish of the evening? I had a few favourites, but the people's choice award for this year went to Ampersand 27 for their chicken galantine with char siu sauce, charred scallion aioli, sweet sesame snap and micro coriander. As the winners of Indulgence, $500 was donated on their behalf to Camp fYrefly - another fantastic organization here in Edmonton. I also quite enjoyed the pate from Nineteen, gooey grilled cheese from ZINC, and the fresco tart from NAIT! 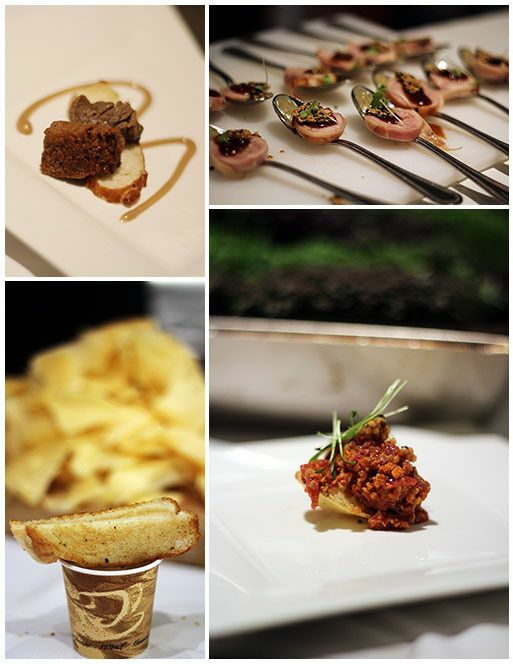 With so many different dishes to eat throughout the evening, I was absolutely stuffed at the end of the night. Congratulations to the Indulgence committee for hosting this fantastic event for 15 years, and thanks to all the chefs, producers, wineries and volunteers that made this night possible. Indulgence really is a must-go-to food event, and if you missed out this year, keep an eye out for tickets for 2016 and I hope to see you there! I don't know about you, but I find it difficult to find good, authentic Malaysian food in Alberta. Very few restaurants in Edmonton serve Malaysian food, and for those that do, I find that the food isn't overly impressive or consistent. Instead of being frustrated by the local options, I took my search to Calgary and found a great spot thanks to a recommendation from a friend. Tucked away near the industrial area of Northeast Calgary, Banana Leaf is in an obscure location but is well worth the effort to find. I stopped by with my parents for an early lunch on a weekday and snagged the last table in the busy restaurant. The restaurant is brightly lit and has a fair amount of seating, but given the small space it fills up quick during the lunch service. To start our lunch we ordered the Deep Fried Crispy Chicken Nuggets with Garlic and Onion ($8.95). These aren't your McDonald's chicken nuggets, they're a cut above. 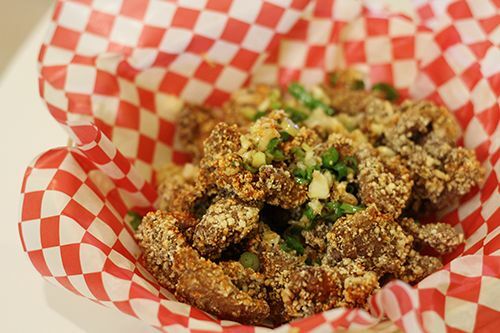 Chunks of chicken thigh meat are battered and deep fried, then tossed in a mixture of garlic, onion, and green onion. The result is a mountain of crispy chicken nuggets full of flavour that you can't stop eating. 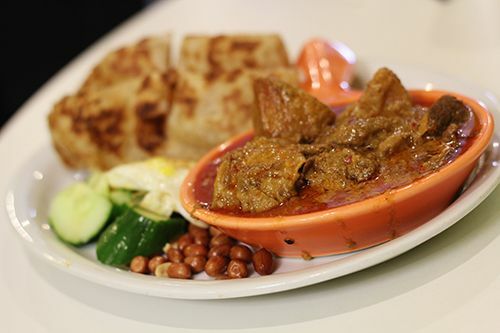 We ordered the Roti Canai with Curry Beef ($13.95) which came with some peanuts, sliced cucumber and egg. For those of you unfamiliar with this version of roti, the dough is made with copious amounts of clarified butter in flour and water. The dough is stretched into an extremely thin sheet before being folded and fried, and the result is a crispy, puffy, layered roti. The roti canai at Banana Leaf was golden in colour, and crispy with just the right amount of layers. The curry beef was rich and fragrant, delivering a good amount of heat with each bite. The beef cubes were tender and flavourful, making this a solid dish overall. The dish I was most looking forward to ended up being the star of our meal: Seafood Curry Laksa with Vermicelli ($11.50). 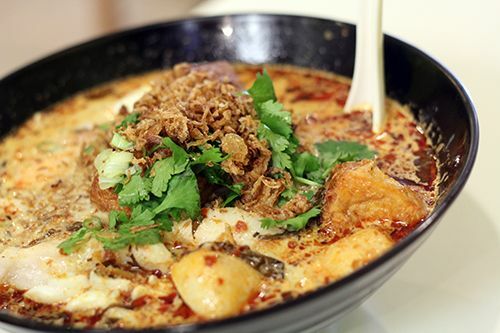 A generous portion of fish, fishballs, egg, and puffed tofu swam in the fragrant curry and coconut milk broth, and the layer of red chili oil gave a punch of heat with each bite of noodles. The laksa was authentic and is the best I've had in Alberta. This noodle soup alone is worth the visit to Banana Leaf. 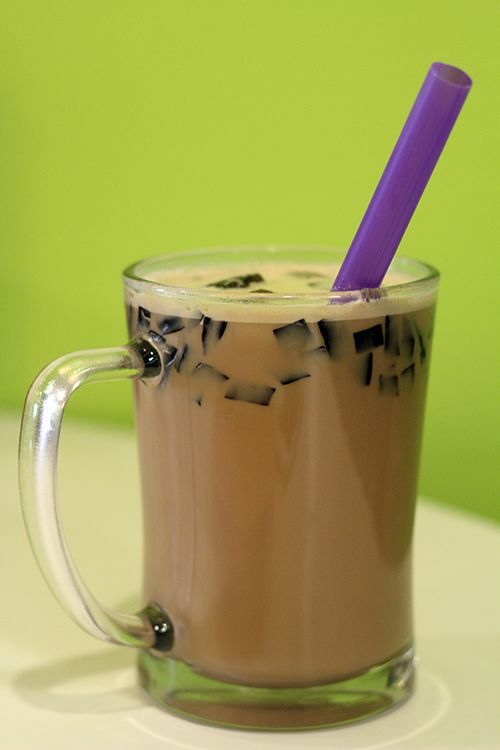 It's great to know that Calgary has a restaurant serving up delicious, authentic Malaysian dishes. Banana Leaf is definitely a hidden gem, the prices are affordable, and I can't wait to be back to try out some more dishes on the menu. If you're in the general area, it warrants a visit! If you don't want to wait for a table, make sure to arrive early and get a big bowl of laksa!